At the beginning of nineteenth century in the University there was a person (father Luigi Moriconi) responsible for the "Machine fisiche", who had to let the lecturers (of mathematics, experimental physics, phylosophy) use those instruments whenever they needed them. Though these figures have always been in a certain way connected to the University, the instruments were probably used also in the College of Nobles without any formal distinctions; for instance the "Camera Fisica" that kept them was placed inside the college for a short period of time. Furthermore, during the "Regno italico", the university was nominally closed for the advantage of the Royal Gymnasium which was the new name for the College of Nobles. The uprisings of Romagna (1831), in which numerous professors of the University of Urbino took part, played a crucial role in the development and management of culture (mainly scientific culture) in Urbino: as many professors and university lecturers had been involved, they were exiled and the Head of the University asked the Congregation of the Studies, which supervised the functioning of the Universities in the Pontifical State, for the permission to make the Fathers of the Scuole Pie (who were teaching in the "Collegio dei Nobili") exceptionally carry out their didactic activity in the University, too. Having received the consensus, he started a practice that would be kept for the most part of the twentieth century: the almost automatic flow into the analogous university course of Physics professors of the Collegio dei Nobili (which later became "Ginnasio-Liceo Raffaello"). This was particularly the case of Experimental Physics: Professor Andrea Marcantonj, who had been holder of the chair since 1830, was exiled in 1831 and Physics (both in the College and in the University) was officially assigned to Cesare Magherini, Director of Collegio dei Nobili. He totally respected the tradition of Scolopi Fathers by combining his capacities of educator with those of scholar of science; he showed those capacities above all when he worked with Inghirami on the drawing of a map for a part of the "New complete Heavenly Atlas", which was then proposed to the most capable European astronomers by the Academy of Science in Berlin. Once the storm had been overcome, the Liceo was regaining its features of boarding school, and the University, included in the group of Secondary universities, was reorganized and divided into four Faculties ("Classes"): Law, Theology, Medicine and Surgery, and Philosophy (which the Physics professor was linked to). Magherini was succeeded by Alessandro Serpieri (1823-1885), who was Director of the Gabinetto di Fisica until 1884 and taught physics at the University of urbino from 1847 to 1884. He was a noble educator and scientist and applied to astronomy, theoretical and experimental physics, meteorology and particularly seismology, obtaining interesting and original results in all of these fields. His presence brought great celebrity to Urbino, particularly for the foundation of a meteorological Observatory (1850) and for his studies on earthquakes. He corrisponded with the main scientist of his time. 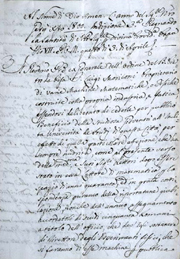 His correspondance is a part of a wider part lot of unpublished remarks, personal documents, manuscripts preserved in Florence, and has been recently studied. This correspondence, covering the period 1843-1885, is made up of 1104 letters sent to Serpieri by 206 correspondents. In the seismological field, Serpieri can well be considered one of the most important italian scientists. He established in 1850 a seismological and meteorological observatory and began regular seismic observations continued until his death (1885). He used, for the first time in Italy, a methodology based on systematic collection of seismic data and subsequent accurate processing of them. 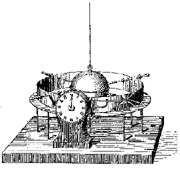 Serpieri also invented an inexpensive and easily assembled seismograph which could identify starting point, time and direction of shock waves; unfortunately it has not survived and we now have only a general design and description. Serpieri was succeeded by Giuseppe Martinotti (until 1897), who came from Pavia: actually in the yearbook of 1884 the name of Massimiliano Martinotti is recorded as Professor; this name, however, is not mentioned anywhere else, since the yearbooks from 1886 onwards show the name of Giuseppe. Rather than to a peculiar case of partial homonymy, this is probably due to an initial misprinting, later rectified in the following yearbooks. Martinotti carried out interesting studies on magnetism and thermomagnetism; he started studies on x-rays, publishing his interesting results in "Il Nuovo Cimento" (1896); furthermore, he strongly committed himself to pursue Serpieri's activities on seismography. He was eventually moved to the Regi Licei by the Ministry for Public Education, being temporarily (for one year only) replaced by Augusto Rovida, Bartoli's disciple in Pavia and Battelli's assistant in Pisa. The following year (1898) the Physics professorship at the "Liceo Raffaello" and at the University was given to Aristide Fiorentino from Livorno, Roiti's collaborator in Florence. He started important studies on acoustics, and was particularly interested in the vocalic phonation. He left Urbino in 1901, when all the local scientific Schools had been suppressed: only the School of Pharmacy was still active, whereas in the non-scientific field only the Law School was still working.